Sexual misconduct charges have exploded across our society from college campuses to the federal judiciary. No area of life is off-limits and nor should it be since sexual misconduct, ranging from sexual assault to sexual harassment has been tolerated for far too long in our society. But with every positive comes a negative and the stakes for a person accused of sexual misconduct have never been higher. Left un-defended, allegations of sexual misconduct will easily derail careers, potential careers and your means of earning a livelihood. If you are facing allegations of sexual misconduct you need to immediately take action. Waiting can be fatal to your reputation and your livelihood. You need to know who is accusing you and how many people may accuse you. Don’t assume that the source you are hearing about is the original source or the only source. Where there is smoke there is fire and you need to identify it and its scope. Without knowing how many people are accusing you or having a good idea of the potential number you will be reacting blindly. In order to identify the scope of the problem, you will need to conduct interviews and investigate the facts. This can only be safely done with professional investigators working for a lawyer hired by you. Only in this way can the investigation work that is done be fully confidential. Trying to investigate on your own or using friends and family is an invitation to disaster as you will likely simply create more evidence against you. Most evidence of allegations is historical and needs to be both discovered and preserved. Facebook, Instagram, and all manner of social media and electronic communication are the foundation of evidence today. Most evidence that an accuser may use is also available to the accused – it’s a question of who has the best records. Nearly all electronic communications can be recovered forensically so do not assume that old data is lost or safely unrecoverable. You will need professional forensic help to do this recovery. Forensic recovery is just another kind of investigation and you will want it to be undertaken by professionals working within the protection of your attorney’s direction. Recognize too that evidence is not simply historical. It is being created in real time all the time. So be aware that what you say and do now is all part of the evidence. Steps 1 & 2 above also require you to know what to do with that information. But that knowledge really needs to be in your possession even as you take those steps. Your “legal strategy” starts the second you learn of your potential jeopardy. While it is understandable that people want to manage a situation without legal help, it is likely to be a mistake. Talk to a lawyer right away – the conversation should be a privileged one. Ask the lawyer to guarantee that is privileged before you start talking. It can’t be just any lawyer you hire. You need to hire a lawyer with specific experience in investigating and defending sexual assault cases. Why sexual assault? Because you cannot count on the allegations merely being limited to “sexual harassment.” The line between actions that can be considered harassment and assault is essentially non-existent. It is only a matter of who brings the allegations that determines this. For example, if the police and prosecution are investigating sexual harassment then it is likely to be considered a sexual assault. If it’s your workplace HR doing the investigation, then it’s likely to be sexual harassment but those same allegations can always and at any time be investigated by the police and prosecutor. So you need a lawyer who can investigate and defend against sexual assault not just an employment lawyer. The “MeToo” movement brings much needed change to our society. But change brings risk. 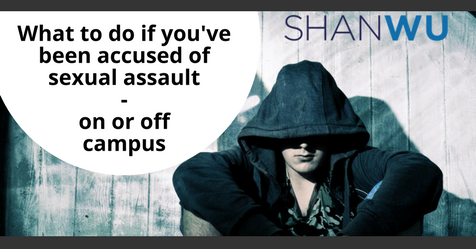 So be prepared and know what to do if you are accused of sexual misconduct. If you are accused of sexual misconduct be sure to identify, preserve and strategize. But do so with the aid of a lawyer experienced in sexual assault investigations and defense.